The Upper Nasoni settlement on the Red River, based on Teran's 1691-1692 expedition. The map, drawn by an unknown member of the expedition, is the earliest known cartographic depiction of a Native American community in Texas. Original map in the Archivo General de Indias, Seville. Artist's depiction of a Caddo temple mound with structure on top, sacred places where Caddo priests conducted ceremonies. Painting by Charles Shaw. 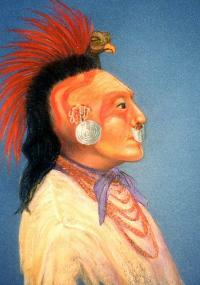 A Caddo man in bird headdress as visualized by artist Reeda Peel. The painting is based on a description of Caddo men in state dress for a meeting with General Manuel Mier y Teran, who headed a Mexican boundary commission sent by Santa Anna in 1828. Painting courtesy of the artist. Mr. and Mrs. A.J. 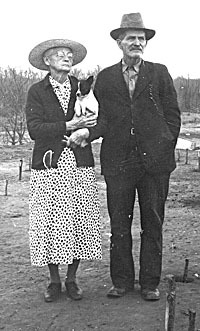 Hatchel (holding JoJo) standing atop the major temple mound on their farm, circa 1938. Photo from TARL archives. When French and Spanish explorers in the sixteenth and seventeenth centuries ventured into the southeast and the area that is now Texas, they passed through many communities of Caddo peoples. Their accounts tell of peaceful hunting and farming folk led by stately chieftains, villages with thatch-covered huts, and patchworks of fields planted with crops. Some of the travelers saw enormous mounds topped with structures, dominating the landscape like small hills. Although elaborate ceremonies were conducted from their lofty heights, the mounds no longer saw the cycles of building and renewal that had marked earlier times. By the time of the European entry, the moundbuilding tradition had effectively ceased. In the country of the Caddo, the Spanish and French competed fiercely for the loyalty of the native peoples. Enterprising French traders established posts and set up a lucrative exchange, trading guns, beads, kettles and metal tools for animal hides and horses provided by the Native Americans. Spanish priests, finding the people to be "peaceful, gentle, and jovial," established missions among the more southerly people with the intent of assimilating and converting the Native Americans and using them as a bulwark against French encroachment. While the Spanish offered only religionwhich the Caddo already had the French brought the much more desired objectsguns. At the Great Bend of the Red River were the villages of the Upper Nasoni Caddo, a name appended to both the people and the location by the French. This sprawling communitysome have estimated it stretched for more than 8 kilometers in lengthsaw its share of Anglo-European visitors. Remnants of the De Soto expedition may have passed through as early as 1542, followed by Henri Joutel in 1687. 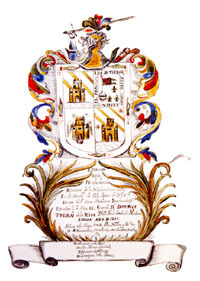 The Teran expedition, led by Domingo Teran de los Ríos, traveled through in 1691-1692. Significantly for researchers today, a detailed map of the village was generated from that latter venture. As shown above, it depicts dispersed clusters of small farmsteads, each containing several buildings, ramadas for shelter, and above-ground granaries. On the west side of the village, there is a mound shown with a structure marked "Temple,"and near the center, the house of the Caddi, or chief. Some 30 years after Teran passed through the community, French trader Jean-Baptiste Benard, Sieur de La Harpe set up a small trading post among the Upper Nasoni people. He had been warmly welcomed by a delegation of chiefs, and in short measure, a relationship was established. In exchange for the European goods that La Harpe brought, the villagers provided a choice spot for his concession on the lands of the chief. The Frenchman found the locale and people exemplary: "
the country is fine, the earth black, and the prairies most beautiful and fertile." Men and women worked the fields, growing corn, beans, watermelons, sunflowers, and other small crops. They hunted the verdant woods and prairies, supplementing their diet with wild foods and game. They crafted distinctive pottery vessels, some artfully decorated with spiral designs and animal-headed handles. And they engaged in trade with the Europeans. But this way of life was to change drastically, as the native peoples continued to be afflicted with diseases carried by the newcomers. With cruel rapidity, the village population diminished. In 1806, members of the Freeman-Custis expedition, who were surveying lands for the Lousiana Purchase, traveled past the Upper Nasoni village and found it abandoned. Roughly 125 years later, archeologists from the University of Texas-Works Progress Administration program began excavations at a large mound on the northeast Texas farm of Mr. and Mrs. A. J. Hatchel. At the mound and in the adjacent fields, they unearthed a complex record of occupations spanning more than 800 years. A cemetery containing more than 60 graves as well as remains of village areas were investigated on sites nearby. Because this cemetery was being looted when the work began, the WPA archeologists thought it best to salvage what information they could. The locale, known to archeologists as the Hatchel-Mitchell-Moores complex, came to be recognized as one of the most important Caddo sites in Texas. But the mound and its surrounding village areas were to take on a greater significance. Through the painstaking research of ethnohistorian Mildred Mott Wedel and others, this enormous archeological complex was identified as the Upper Nasoni village visited by the early travelers and known previously only through their records, maps, and drawings. There La Harpe had traded his wares on the land of the chief; on the mound had stood the awesome structure where religious leaders conducted their rituals. By poring over original documents (rather than poorly made translations) and ground-testing distances recorded by La Harpe, Wedel was able to link the location of the village to the historic documents. With this critical correlation, we are now able to examine late-period evidence from the archeological site in the context of those historic accounts, providing a much fuller and richer image of the Upper Nasoni village as it neared its demise. The section following offers a look at WPA excavations at the site through a gallery of archival photos from that undertaking. Teran map cartouche, or key. One translation reads in part: "This new discovery of the Caddudacho Nation was...made by General Don Domingo Theran de los Rios, Lt. Gen. of all New Spain, in the year 1691. This visit was made in the said section and province on the 28 of November with only thirty men, in the said year." Closeup of Teran map depiction of house of the Caddi, or chief, at the Upper Nasoni village, circa 1691. WPA excavations on mound at Hatchel site. Photo from TARL archives. Through the painstaking research of ethnohistorian Mildred Mott Wedel and others, this enormous archeological complex was identified as the Upper Nasoni village visited by early travelers and known previously only through their records, maps, and drawings.